There was once an old, old castle- it was so old that its walls and towers and turrets and gateways and arches had crumbled to ruins, and of all its old splendor there were only two little rooms left; and it was here that John the blacksmith had set up his forge. He was too poor to live in a proper house, and no one asked any rent for the rooms in the ruin, because all the lords of the castle were dead and gone this many a year. So there John blew his bellows and hammered his iron and did all the work which came his way. This was not much, because most of the trade went to the mayor of the town, who was also a blacksmith in quite a large way of business, and had his huge forge facing the square of the town, and had twelve apprentices, all hammering like a nest of woodpeckers, and twelve journeymen to order the apprentices about, and a patent forge and a self-acting hammer and electric bellows, and all things handsome about him. So of course the townspeople, whenever they wanted a horse shod or a shaft mended, went to the mayor. John the blacksmith struggled on as best he could, with a few odd jobs from travelers and strangers who did not know what a superior forge the mayor's was. The two rooms were warm and weather-tight, but not very large; so the blacksmith got into the way of keeping his old iron, his odds and ends, his fagots, and his twopence worth of coal in the great dungeon down under the castle. It was a very fine dungeon indeed, with a handsome vaulted roof and big iron rings whose staples were built into the wall, very strong and convenient for tying captives to, and at one end was a broken flight of wide steps leading down no one knew where. Even the lords of the castle in the good old times had never known where those steps led to, but every now and then they would kick a prisoner down the steps in their lighthearted, hopeful way, and sure enough, the prisoners never came back. The blacksmith had never dared to go beyond the seventh step, and no more have I- so I know no more than he did what was at the bottom of those stairs. John the blacksmith had a wife and a little baby. When his wife was not doing the housework she used to nurse the baby and cry, remembering the happy days when she lived with her father, who kept seventeen cows and lived quite in the country, and when John used to come courting her in the summer evenings, as smart as smart, with a posy in his buttonhole. And now John's hair was getting gray, and there was hardly ever enough to eat. As for the baby, it cried a good deal at odd times; but at night, when its mother had settled down to sleep, it would always begin to cry, quite as a matter of course, so that she hardly got any rest at all. This made her very tired. The baby could make up for its bad nights during the day if it liked, but the poor mother couldn't. So whenever she had nothing to do she used to sit and cry, because she was tired out with work and worry. Presently, over the noise of the bellows and over the clank of the iron, there came another sound. The blacksmith and his wife looked at each other. But the noise grew louder- and the two were so anxious not to hear it that he hammered away at the goat-shoe harder than he had ever hammered in his life, and she began to sing to the baby- a thing she had not had the heart to do for weeks. But through the blowing and hammering and singing the noise came louder and louder, and the more they tried not to hear it, the more they had to. It was like the noise of some great creature purring, purring, purring- and the reason they did not want to believe they really heard it was that it came from the great dungeon down below, where the old iron was, and the firewood and the twopence worth of coal, and the broken steps that went down into the dark and ended no one knew where. "I am not taking the hammer because I think there is something there," said he, "but it is handy for breaking the large lumps of coal." "I quite understand," said his wife, who had brought the coal home in her apron that very afternoon, and knew that it was all coal dust. So he went down the winding stairs to the dungeon and stood at the bottom of the steps, holding the lantern above his head just to see that the dungeon really was empty, as usual. Half of it was empty as usual, except for the old iron and odds and ends, and the firewood and the coals. But the other side was not empty. It was quite full, and what it was full of was Dragon. But the dragon was too quick for him- it put out a great claw and caught him by the leg, and as it moved it rattled like a great bunch of keys, or like the sheet iron they make thunder out of in pantomimes. 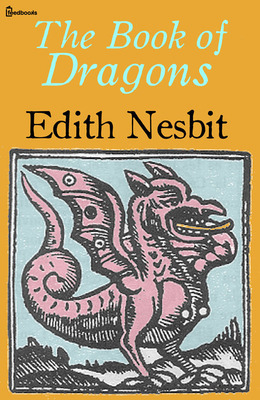 "No you don't," said the dragon in a spluttering voice, like a damp squib. "Deary, deary me," said poor John, trembling more than ever in the claw of the dragon. "Here's a nice end for a respectable blacksmith!" The dragon seemed very much struck by this remark. "Do you mind saying that again?" said he, quite politely. So John said again, very distinctly: "Here- is- a- nice- end- for- a- respectable- blacksmith." "Oh, I don't mean what you mean," said the dragon, "but I should like you to do a job for me. One of my wings has got some of the rivets out of it just above the joint. Could you put that to rights?"